Crustini’s are on the menu a lot in our house! We prepare them in many different ways and serve them with what’s on hand. I often grill the little slices of Baguette; bake them in the oven on a stone and even bake them in the toaster oven on a mini stone, which is how I’ve displayed these! Drizzle the slices of bread with extra virgin olive oil and sprinkle with kosher salt. Bake until crispy or your liking turning the toasts half way through the baking process. While hot, immediately rub each toast with a fresh garlic clove. 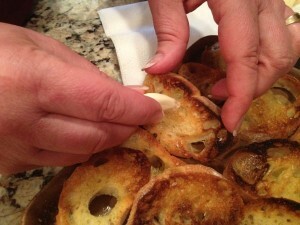 You will usually use up almost an entire clove because the abrasiveness from the crust nicely breaks down the garlic. Before we start dinner, most days “Bill needs a snack”. This day was no different! I prepared the garlic crustini’s with a cheese platter. The cheeses that we enjoyed were an Aged Gouda, Italian Truffle, Aged Cheddar, Manchego and Jarlsberg. 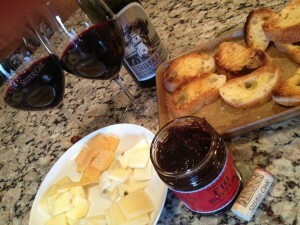 We also enjoyed the sweetness of the Fig butter, which paired perfectly with the 2003 Silver Oak. Bill and I both really enjoyed this wine! While enjoying the appetizer, it was tough to save a glass for our meal. It was a nice start to a great night at home!